There are tons of Worship Leader Resources in the world, but not many that offer what this package offers. Here we have a collection of ebooks available at a bargain basement price that covers every aspect of leading worship and heading up a worship team. It is not 101 Biblical reasons why we lead worship, but rather practical, useful tips and techniques you can apply right now... that's right, as soon as you learn them! The "Worship in a Nutshell" suite of ebooks have been designed to cover pretty much everything there is to know about worship leading. It has been compiled by Darin Browne, who has been leading praise and worship for over 20 years, and has been specifically tailored to be the most useful and easy to apply Worship Leader Resources on the internet today. Some Worship Leader Resources offer advice on how to prepare your heart for worship, how to manage your team or even on occassions how to arrange songs, but none of these Worship Leader Resources offer the entire spectrum of how you can become a successful, powerful and anointed worship leader and director. These ebooks contain secrest that most leaders closely guard, yet they are revealed here in a simple to read and easy to apply format. Looking for Worship Leader Resources That Actually Work? There are tons of Worship Leader Resources in the world, but not many that offer what this package offers. 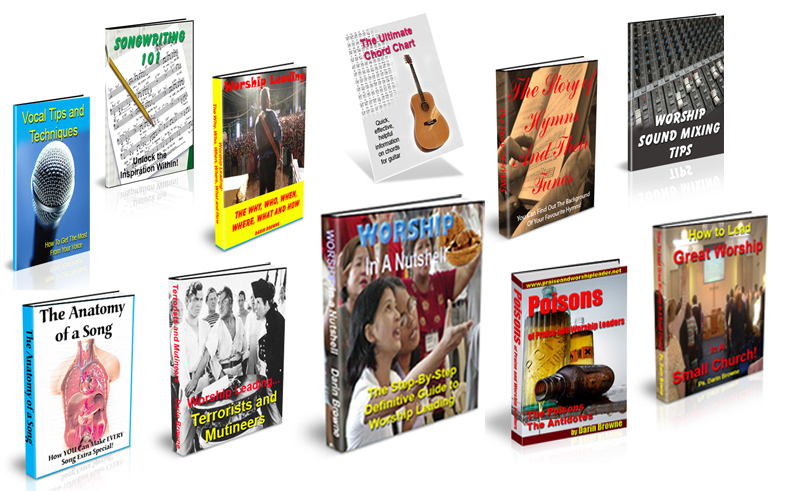 Here we have a collection of ebooks available at a bargain basement price that covers every aspect of leading worship and heading up a worship team. It is not 101 Biblical reasons why we lead worship, but rather practical, useful tips and techniques you can apply right now… that’s right, as soon as you learn them! The “Worship in a Nutshell” suite of ebooks have been designed to cover pretty much everything there is to know about worship leading. It has been compiled by Darin Browne, who has been leading praise and worship for over 20 years, and has been specifically tailored to be the most useful and easy to apply Worship Leader Resources on the internet today. Some Worship Leader Resources offer advice on how to prepare your heart for worship, how to manage your team or even on occassions how to arrange songs, but none of these Worship Leader Resources offer the entire spectrum of how you can become a successful, powerful and anointed worship leader and director. These ebooks contain secrest that most leaders closely guard, yet they are revealed here in a simple to read and easy to apply format. Darin and the team are committed to seeing you develop into the best possible worship leader you can become, and so when you buy the complet and ever expanding passage, you can get all the subsequent books at no charge. So you will constantly be challenged and encouraged in your ministry and taught new ideas as they arise… and you will be able to keep in touch with other worshipleaders around the world as you continue in your walk of faith! this is better than a conference, a DVD or a new CD… it’s a family, and it is a community that will keep your ministry on the boil! So, do your worship leading a huge favour and get the right training at a bargain price. No travel, no hotel bills, no conference fees, and it lasts a lifetime! This is the Worship Leader Resources you have been waiting for!